Al Jazeera’s the best outlet for often scathingly honest news and critique about Greece coming from other than the usual direction: i.e. our Nearer East, which probably has our number more clearly than any Western observer. In fact, Mr. Pathetic from “Magnificent Turks” and the origins of this blog asked to be removed from this blog’s mailing list, because his delicate patriotic sensibilities were ruffled by a recent Al Jazeera repost: Συγχαρητήρια! Congratulations! for trumpetting Al Jazeera headline: “Greece, a front line for state-sponsored racism in Europe” , an article which continues with the subtitle: “Once the cradle of European civilization, Athens is now the center of a continental decivilizing process.” So maybe we can excuse the boy his legitimate fatherland-loving outrage. 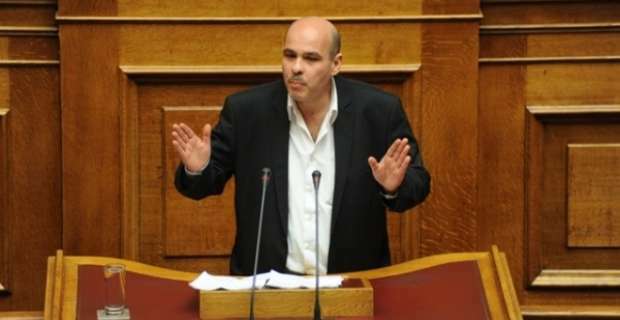 A Greek MP has joined Syrian refugees in a hunger strike outside the Athens parliament to protest against the government’s refusal to help them move to other European countries to reunite with relatives. “A lawmaker’s duty is to be here on the streets, on the side of the weak, not inside the luxurious parliament,” the deputy, a 51-year-old doctor, told Reuters. Can’t say for sure how “real” or “sincere” this is, or if it’s just more of Syriza’s populist demagoguery, but the Talmud says that a good act creates good consequences, even if the actor’s intentions are not entirely pure…so, go for it, I say. It’s certainly speaks well for Greeks generally (or at least Syriza supporters) and is a positive sign that an MP from a party that technically has the numbers to topple the ruling coalition can do something like this without fear of alienating his base for being an “illegal refugee” supporter. Some Greeks still have a soul or — more encouragingly perhaps — a mind. At least enough of one to take their thoughts off of their narcissistic, navel-gazing self-pity.